The rigid-body haul truck is an icon of the technology required to move massive amounts of ore and waste in surface mining operations. For conventional, large-scale applications it’s probably safe to assume that most mine operators regard rigid-body rigs as the gold standard for haulage efficiency in typical mine conditions. But, not unlike the recent slippage in gold prices, some industry observers have perceived a slight softening in the haulage status quo—opening a window of opportunity for enterprising truck builders to demonstrate that rigid-body fleets are not always the best high-tonnage haulage solution. That’s a premise that the major mine-truck OEMs might be willing to vigorously debate as they brandish bulging sales books for their big rigid-body haulers. Competition within this sector is as intense as ever, with upgraded models from the big builders steadily entering the market, while both in-the-iron and drawing-board prototypes of new mid-range and ultra-plus-class capacity rigid-body haulers have been rolled out—or in one case, rumored—even from sources that lie outside the focus of press and market attention typically paid to Caterpillar, Komatsu, Liebherr or Hitachi. In mid-2011, for instance, a small engineering firm based in Novi, Michigan, USA, announced it had produced the first unit of a new 400-ton-class truck model, the Elite 6000—a product of collaboration between the Michigan firm, known as Detroit Heavy Truck Engineering LLC (DHTE) and Elite, a joint manufacturing venture involving China Metallurgical Group Corp. and Hunan Valin Steel Co. Preliminary specifications released by DHTE for the 363-mt-capacity hauler include a choice of MTU’s 20V4000 or Cummins’ QSK78 diesel engines, a Siemens AC electric drive system, a selection of body types and a long list of available options. The truck was produced and assembled in China using engineering and design specifications developed by DHTE, which reportedly intends to eventually roll out a full line of haulers in the 150- to 400-ton payload range. 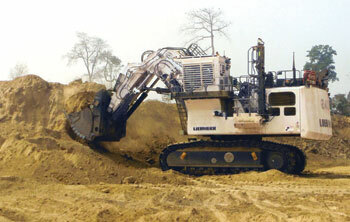 A recent report indicates the company will introduce a 240-ton model in 2012. Meanwhile, Belarus-based truck builder BelAZ has been rumored for several years to be working on the prototype of a 450-ton-capacity hauler, and recent trade-journal news reports indicate the giant truck is tentatively scheduled for completion in March 2013. It reportedly will have eight wheels and AC electric-drive propulsion. However, it should also be noted that a 2011 market-strategy update paper issued by BelAZ Director General Alexandrovich Parkhomchyk made no mention of this project in the company’s 2011-2015 Program of Investment Development. Currently the largest BelAZ rigid hauler is the 360-mt-capacity 75601. In October 2011, Caterpillar introduced the latest version of its 200-ton-class hauler, the 789D, with nominal payload of 181 mt—an increase of 2.5% from the previous model. The mechanical drivetrain is powered by a Cat 3516C EUI quad turbocharged diesel engine as standard equipment, providing 2,100 hp (1,566 kW), about 10% more than the previous model and suitable for operation at altitudes up to 12,000 ft (3,658 m) without derating, according to Cat. The 1,900-hp Cat 3516B diesel also is available for mines requiring an engine to match with existing fleets. Also joining Cat’s rigid-hauler lineup is the 777G, an upgrade of the 777 series 100-ton-class trucks that features new transmission controls and Cat’s Tier 4 Final engine platform. New emissions control strategies, which enable the Cat C32 engine to meet Tier 4 Final emissions regulations in the U.S. and Canada, include an NOx Reduction System and two Diesel Oxidation Catalyst canisters, one for each bank of cylinders. This system, said Cat, takes advantage of the cleaner, less corrosive properties of ultra low sulphur diesel fuel and low ash engine oils to maintain service intervals and component life. The two DOC canisters trap residual hydrocarbons in the exhaust. According to the company, its 777G Tier 4 Final strategy is transparent to the operator and does not require additional service for the machine. Rising capital and operating costs, tire life and even tire availability are ongoing areas of concern with high-capacity rigid-body trucks, and suppliers of tractor-trailer type haulage systems have zeroed in on these issues to promote their own systems, which use smaller, cheaper tires and less fuel-hungry engines than the big rigid rigs. They’ve also devised trailer-based technology for reaching the 400-ton-payload range that, until recently, was the exclusive domain of ultra-class haulers. Although the practical range of loading-equipment options is narrower with trailer units, and there are some mine-site conditions that can rule out their use, tractor-trailer systems and their variants offer a cost-effective alternative for many applications. Consequently, they are increasingly finding niches in both mainstream and specialized surface haulage applications. For example, during a recent visit to Western Australia’s Pilbara, E&MJ observed tractor-trailers being used side-by-side with rigid haulers at Fortescue Metal Group’s mines to transport iron ore over distances that would pose tire-wear problems for the rigid trucks, which instead are used primarily on short hauls to the crusher, and to carry ore to central dumping points for subsequent transfer to the tractor-trailer haulers. Queensland, Australia-based Powertrans has developed a set of mix-and-match system components that allow users to put together ‘road trains’—multiple trailers pulled by a Powertrans Prime Mover tractor unit that can handle up to 300 mt total payload, and significantly more by employing their Powertrailer, a heavy-duty, high-capacity haulage trailer equipped with a diesel engine, cooling system, transmission and drive axle system, all controlled from the Powertrans prime mover. Both the Prime Mover and Powertrailer are equipped with Cummins QSK19 diesel engines. Powertrans claims that owning and operating costs of a road train are significantly lower than large off-highway mining trucks because capital costs are about half the cost of larger units, as are maintenance costs. Powertrans units use readily available OTR light earthmoving tires. As a result, loaded speeds in the order of 55 km/h and unloaded speeds of 75 km/h are possible. In mining applications with haul distances between 10 km and 50 km, Powertrans said its equipment can offer a viable low-cost and flexible alternative to rail or conveyor-based transport, with generally lower infrastructure costs. Fitting into a slot somewhere between the traditional rigid-body trucks and tractor-trailer configurations are those offered by builders such as Haulmax and Western Star—trucks that may resemble, at first glance, vocational dump trucks but have been designed to handle the tougher demands of mining. Haulmax offers multi-axle models that are designed to fill dual roles as a mine haul truck as well as a conventional over-the-road Class 8 rig. The drive train is all Caterpillar, with power from a Cat C27 diesel running through a 7-speed power shift transmission. The 6 x 4 Haulmax 3900 series can handle payloads from 80-85 mt in the -D version and up to 108 mt in the bare-chassis -G model. Western Star’s 6900XD model also is a 6 x 4 off-and-on/highway dump truck capable of handling a 40-ton payload. The rig is powered by a 500-hp Detroit Diesel engine connected to an Allison seven-speed transmission. A dual-circuit air brake system is standard, augmented by a Jacobs compression brake; optionally available is an Allison hydraulic transmission retarder. Taking a much larger step beyond conventional technology, truck builder ETF has designed a haulage system that begins with a futuristic-looking truck unit with 240-ton-capacity—eventually to be available in a range of payload capacities—and allows users to configure these units either as stand-alone haulers or combined into multi-unit haulage trains that are claimed to be capable of handling up to more than 800 tons total payload. The company also promotes a business model that departs radically from conventional practice. Earlier this year, ETF CEO Eddy de Jongh told E&MJ: “We believe that capital goods such as our products should be carefully maintained in order to have the best possible technical availability and productivity against the lowest cost per ton in the industry. Therefore we decided that we will only rent our trucks including an innovative life cycle Maintenance and Repair Contract (MARC) with a guaranteed technical availability of 95% including tires. “This means the customer always knows his cost per ton as we charge him a fixed amount per ton/km during the 90,000 hours (11-12 years) of the contract. He does not have to worry about warrantee claims, spare parts availability and mechanics; we take care of it all. The client can concentrate on mining,” de Jongh said. de Jongh said the first three ETF units to go into a production environment would be shipped to an iron ore producer in Brazil at the end of August 2012. The basic layout of the ETF haulers, as illustrated in a PowerPoint presentation provided by the company, represents a mind-boggling departure from conventional design practices; in fact, about the only familiar concepts displayed by the ETF units are a cab and a dump body—and even the cab layout differs from the norm by having a center-positioned operator’s seat flanked by ‘trainer’ seats on each sides. Power comes from four independent engines stacked in a “power pack” module behind the cab. Only one of the four MTU/Mercedes-Benz OM-502, 480-kW Tier III engines is used during empty travel, two or three engines are in use during loaded hauling and the fourth engine comes on line when full power is required while hauling on grade. In the event that one engine develops a problem or fails, the truck can continue to operate with the remaining engines, returning to the workshop where the failed engine can be removed and replaced with another modular unit in 15 minutes, according to ETF. Modularity also extends to the tires and suspension, which on ETF’s MT-240 model include 20, 24.00R35 tires mounted in dual-wheel groups on five axles per side, with four axle units per side driven and one non-driven. In the event of a flat tire, the individual axle unit can be lifted off the ground, preventing further tire damage; and the non-driven axle units also are lifted during empty operation. Each of the 10 axle units allows the wheels to oscillate 10° side to side. This design, according to ETF, combined with 950-mm of suspension travel, almost completely eliminates the chassis torsion and sudden tire overloads experienced by conventional haulers when operating on uneven surfaces. ETF said it has developed a unique steering system in which all wheels are steered when operating at low to medium speeds, while at higher speeds the last two axle units gradually lock in position for better stability. Also unique is the company’s claim that each of its mine trucks can be joined in a ‘Haul Train’ in which two, three, four or more individual trucks are linked together by steel arms carrying an enclosed armored data cable. Only one driver is required to control a train, as data from the lead, operator-driven truck is transmitted via the cable link to the following trucks, controlling engine power, steering direction and brakes. When arriving at the dump point, each unit in the train can be unloaded individually or all can be dumped simultaneously, either to the left or right. It should be noted that the company was unable or unwilling to provide a photograph of an actual truck for this article; to date, it appears that all depictions of the units released to the public have been computer generated. And, it remains to be seen whether any units actually enter regular service or if the concept itself gains traction with mine operators used to a completely different technology and business model. Nevertheless, the company should be credited for distilling the features, functions and accessories that would likely appear on the most fanciful haulage wish-lists of OEMs, owners and operators into what appears to be a plausible design concept. Production haulage is a critical link in the mining sequence, but even under the best of conditions it’s a repetitive task that often involves long distances and extended work hours. Combine those ingredients with the size, weight and speed of the machinery involved, along with the constant vibration, noise and limited visibility experienced by operators, and it’s easy to see why most surface mining accidents involve mobile equipment engaged in hauling activities. 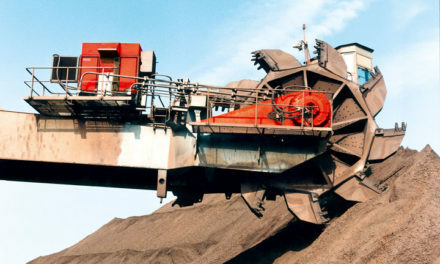 But, regardless of the specific vehicle type or activity—it could be a haul truck, a wheel loader, a service truck or even an employee’s personal vehicle—fleet owners have come to realize that accidents largely stem from factors that directly involve and affect the operator, such as fatigue, distraction or simple unawareness. In recent years, a number of mineral producers as well as commercial and academic organizations have taken a closer look at ways to identify, warn and to whatever extent possible, eliminate these human-factor hazards from their mobile equipment operations. The results of this increased level of attention include a number of new technologies that attack the problem from different aspects. Switzerland-based SAFEmine Ltd., for example, has developed a mine traffic-awareness system that uses a combination of GPS technology and vehicle-to-vehicle communications to determine the exact location of a SAFEmine-equipped vehicle and to indicate the position of other vehicles in the immediate surrounding area, with coverage extending in all directions starting about 2 m from the vehicle out to 500 m. In addition, the system calculates nearby vehicles’ paths using a proprietary algorithm and warns the driver of each equipped vehicle of imminent vehicle-movement or proximity situations that could pose a hazard. In practice, the dashboard-mounted SAFEmine unit displays a compass-like arrangement of indicator lights. When the system detects a vehicle in proximity, it illuminates the appropriate indicator lights to show the driver the relative position and distance of the detected vehicle(s). An alarm will sound if the system predicts that a potential collision is imminent and will continue to sound until the collision threat abates. The indicators will show green, then red and then will flash as the vehicle nears another vehicle. The SAFEmine system optionally can provide voice notifications that inform the driver of the type of vehicle detected; it also can be used to announce traffic-condition alerts such as speed zones or stop signs. It will also display lighted indicators on the compass dial when an equipped vehicle approaches a selected object at a predetermined location, such as a power line. SAFEmine units, taking advantage of the options available, can be configured in a variety of ways, ranging from basic proximity detection and collision alarm functions, to obstacle detection, personnel detection, local hazard alarms, live tracking, and event recording through stored log files. Their functionality extends beyond the typical mine-site haulage and support fleet to include property-wide traffic situations such as employee transport routes, for example. In a recent application of SAFEmine technology at Hecla’s Greens Creek mine on Admiralty Island, Alaska, the company needed a way to augment its existing radio call-out procedures to increase driver awareness of approaching traffic and improve safety on a 19-km-long, single-lane access road that is used by employees traveling to and from the mine, as well as ore haulage and freight trucks. System requirements included the ability to alert drivers to an approaching vehicle beyond line-of-sight and as far away as 300 m in order to provide time to react. No data communications infrastructure was available along the road, thus requiring the use of peer-to-peer notification between vehicles. The SAFEmine system selected provided two main functions: traffic awareness that shows where other vehicles are located; and collision warning that predicts if the paths of two or more vehicles will converge, resulting in audible and visual warnings to the driver(s) causing the dangerous situation. To provide advance notice of another vehicle ahead, SAFEmine also enabled voice announcements. At a preset detection distance of 300 m, an announcement is given in the cab indicating the type of vehicle that is approaching. LED indicators show the position of the other vehicle and indicate distance by changing color: green for 300-100 m, red for 100-10 m, and flashing red closer than 10 m. Because vehicle speed control along the access road is critical to safety, the system also provides audible and visual alarms to drivers when speed limits are exceeded. “Geo-fences” or zones are implemented to allow different alarming schemes in particular areas. For instance, voice and collision alarms are not activated near the mine maintenance shop due to the presence of numerous vehicles in this area; however, traffic awareness indicators function the same in all areas. Optalert Ltd., a company based in Melbourne, Australia, has developed a fatigue detection and alerting system for drivers that employs a unique set of driving glasses. Optalert’s system uses infra-red light to measures a driver’s levels of alertness continuously in real time. The glasses—connected to a small computer processor in the vehicle—emit and detect low levels of infrared light to sense movements in the eyes and eyelids. Data regarding these movements are fed into the computer, which calculates a driver’s level of drowsiness. The system sounds an alarm when eye and lid movements indicate the driver is becoming drowsy. Optalert recently demonstrated the product at the port of Bunbury, Western Australia, where haulage and logistics contractor Bis Industries delivers copper concentrate by truck 150 km from a customer inland. The latest version of the product, according to Optalert, is fully portable, providing the ability to switch the unit between vehicles while the driver still retains his own uniquely calibrated glasses. The system’s processor, modem, repeater and speaker are packaged in one compact case. “With soft or hard mount options available, users now have the choice of whether they want the system temporarily connected to the vehicle or hard mounted via a permanent base. The install time is now also significantly reduced, improving vehicle down time during installation,” said Optalert Managing Director John Prendergast. Portability allows the fatigue risk-reduction capability of the system to be extended beyond the workplace. “Many of our customers are very concerned about the journey home for their drivers. That drive home, which can be anywhere up to two hours for some operators, has been risky for tired drivers who’ve just completed a long and grueling shift, often at night. The Portable System allows the driver to gain direct feedback on their alertness levels, up to half an hour before the driver feels any drowsiness,” said Prendergast. The company also recently updated its Fatigue Risk Profiler, a tool to help managers and drivers understand the complexity of drowsiness by accurately measuring and displaying a driver’s alertness score and then translating that as an impact on safety across the mine site. The updated profiler, according to Optalert, resulted from work carried out for the Australian military. PreviousBase Metals: What Lies Ahead?